Members of the union will now be balloted on industrial action. A Teachers pay protest earlier this year. MEMBERS OF THE Irish National Teachers Organisation have rejected government proposals on the salary scale for new entrants. The proposals sought to restore pay equality for teachers recruited since 2011. The union said that the proposed agreement left several new entrant cohorts from 2011 onwards paid less than their colleagues. The proposals were rejected by 53% of voters and turnout was 55%. “Notwithstanding progress to date on pay equality, the proposed agreement by Government failed to signal an end to pay inequality for all new entrants,” INTO General Secretary Sheila Nunan said. Acting in solidarity with their colleagues who are paid less for doing the same job, our membership has signalled that they will not stand for any agreement which leaves them in a similar position. 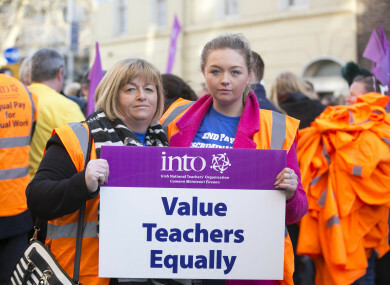 The three teacher unions – the INTO, the ASTI and the TUI – have put the proposals to their members without giving any recommendation in favour of or against them. The INTO result is an exact reversal of the Teachers Union of Ireland vote from last week which was 53% in favour to 47% against. TUI President Seamus Lahart give the proposals a cautious welcome saying they represent another step in the campaign for pay equality. “There is no such thing as partial pay equality and the continuing injustice of discrimination against new and recent entrants to teaching remains to be comprehensively addresse,” he said. INTO’s Central Executive Committee will meet next week to consider the result and a forthcoming ballot on industrial action. Email “INTO rejects government's pay proposals for teachers recruited since 2011”. Feedback on “INTO rejects government's pay proposals for teachers recruited since 2011”.